Today, Cassie devotes the entire episode to answering listener and reader questions from Facebook, Instagram, email, and other social media. 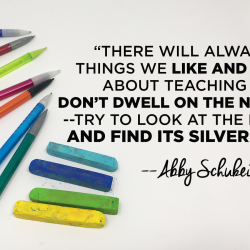 Take a listen as she talks about working with chalk on ceiling tiles, why she hates glue bottles, and how she takes care of herself and keeps her energy up throughout the year. Full episode transcript below. Cassie: All right, it’s time for one of my favorite types of episodes that we could possibly do on this podcast. I’ve done one before, and it’s back by popular demand, mostly just because I love doing them so much. I am doing a Q and A podcast. I am the worst at answering emails, or questions on Messenger, or direct message, or whatever outlet that I get questions. I’m just the worst. You can ask my husband. He’ll text me and email me all day long. I don’t know why. I mean, I’m going to see him tonight, and then I just saw him in the morning. I mean, gosh, how much Cassie does one person need? But I don’t even answer those. So if you have sent questions my way, regardless of how you sent them to me, there’s a good chance I neglected to look at them, and also, of course, answer them. But I’m doing it today. If it makes you feel even better, knowing that I don’t answer my husband’s emails, I also have discovered something really cool that I totally don’t recommend. You don’t have to always check school email, either. It’s more like, you remember when we were kids, and we all learned the saying, “The more you know.” Ignorance is bliss. That’s a lie. It’s more like, “The less you know.” And with that in mind, today, I’m going to dig through some of those emails and questions. And we’re going as far back as Myspace, JK. And I’m going to answer some questions that have been thrown my way. So I hope you’ll join me because I’m Cassie Stephens. I’m answering questions. And this is Everyday Art Room. I think I’ve shared with you before that one of my favorite things to do is read Dear Abby columns, which is kind of how this whole idea came to be. So I now have the pleasure of reading these questions. So let’s just get started. “Hello, Cassie. I follow your blog, and I’m inspired by all that you do with your students. I am reaching out because my magnet coordinator came across your ceiling chalk, tile drawing post,” boy, that is a mouthful, “and would like to do something similar. Were there any safety concerns that you needed to ask about before having students draw onto the tiles?” Great question. In case you’re not familiar with what she’s asking about, I, every year for the past, I guess this will maybe be my fifth year, we have done a ceiling, a chalked ceiling tile project with my second-grade students. And I believe there might be a podcast all about this. There are definitely several blog posts about this, and videos on my YouTube channel. So the ceiling tiles, they’re probably similar to what you have in your building. They have a front side that you normally see when you look up. And it looks as though it’s got kind of a paint, almost like a gesso on it, and it’s got little perforations all throughout. I noticed that that side was not very conducive to drawing on, but the other side, which has serial numbers written all over it, actually has the exact same kind of texture as a sidewalk. And it worked really well, so well that we’ve been doing it ever since. And my students, we’ve never had any questions or concerns. Our fire marshal has come and gone, many years, and never said a single peep about the ceiling tiles. And we simply do the drawings on the reverse side of the tile, with chalk. Personally, I really love Faber-Castell’s chalk brand, because the colors are so vibrant. And if you check out my YouTube channel, you’ll see the different themes that we’ve done throughout the years. My custodian buddy puts them in the ceiling, and then that’s where they stay. They are our legacy that we leave behind when we leave second grade, and then move on, and leave this school. So, yeah, it’s a fun, great project, and I really recommend it. Thanks for the question. All right, next one. “Wondering why you use regular Elmer’s Glue, versus Elmer’s School Glue. Thicker, so you can use a paintbrush??? ?” Four question marks. Okay, so let me backtrack, in case you’re wondering why she’s mentioning a paintbrush. To know me is to know my pure hatred of glue bottles. I absolutely hate them. I remember my first year teaching, my first, jeez, like 10 years teaching, seeing the kids, like the fury is still with me, seeing the kids take a pencil and stab it into the top of the poor glue bottle, because they’re so frustrated, because the thing is clogged; or using their scissors, or cutting into it, or taking the entire cap off, and then having a huge spill of glue. I hate glue bottles. And then, don’t even get me started on refilling them. So a long time ago, I kicked glue bottles to the curb. And I got a bunch of those little condiment cups, fill them with just a tiny, little bit of glue, like I’m talking a quarter-inch of glue at the bottom of the cup, put a lid on it. And my students apply glue with those really junky, dollar-store paintbrushes. That’s what they use to paint the glue around the edges of whatever they’re gluing. It might sound tedious, and it might sound like something that takes a while, but I’ve got them trained. And they do it beautifully. They wouldn’t know how to operate a glue bottle if their life depended on it, but by golly, they can glue things down with their little glue brush and their glue cup. To me, it reminded me of when I was in high school. I used rubber cement, this makes me sound old, you know, to glue different things down, and to huff every now and then. I’m kidding. And I remember that that little lid had the brush stuck to it. And so when I was struggling so much with the glue bottle conundrum, that’s the idea that came to me, to give them a little cup with a little brush. So now, back to her question; why regular glue, versus Elmer’s School Glue? Maybe I’m wrong, but it’s my belief, because I’ve noticed that the School Glue is a little runnier, that there’s maybe a filler added to it, perhaps just water, and that’s what makes the School Glue wash out of clothing a little bit easier. But it also makes it so it just doesn’t stick as well, and I find it to be a little bit runny. So therefore, I always use regular glue. Also, I do a couple of projects with black glue. I do a Sandra Silberzweig portrait project, where my students, and you can find this lesson on my blog, where my students draw with glue, the regular glue that I’ve mixed with India ink. And they draw with that mixture, a line drawing on a black piece of construction paper. And then they use chalk on top of that, and it just looks really beautiful and vibrant. But it only works with the regular glue, because again, the school-grade glue is a little bit runnier. That was a long-winded answer to your question. Moving on. “Hi. Just wondering, I am working on my supplies list for the school year. You have a video where you talk about Pelikan.” She’s talking about a kind of paint, not a bird. “Are those watercolors? Or are they tempera cakes? Any new videos for supplies? Thank you.” Okay. So she is asking about Pelikan brand paint. I can’t remember where I got the idea to buy this particular brand of paint, but we have used it a couple of times in my room. It is very similar to what I would call a gouache, or like a tempera cake. Tempera cakes are kind of like a gouache in that respect, that they’re more opaque than a watercolor paint. And I really like them, because they come with this huge assortment, I think it’s like 24 different colors. And we were using them to paint our clay projects. They work beautifully for painting clay that doesn’t get fired in the kiln. Also, when I was working on my clay book, which, by the way, is called Clay Lab for Kids, and it’s available on Amazon, or wherever you buy books. Anyway, I loved using Pelikan brand paint on air-dry clay projects, because again, it was opaque, and it provided so many different colors. It’s not something that is a necessity in the art room. It’s definitely a luxury, but if you have the budget or a grant, definitely something you might consider splurging on. I really like this next question, because I feel like so many of us, myself included, can relate. “How do you keep your energy up? I’m on my 11th year of teaching art at a big public school, and I see that you walk in the evenings. And exercise does help. It’s just, often, I have no energy to do that. I’m on fall break this week. And as it comes to an end, I’m just like, how can I do better with my afternoons, when all I want to do is sleep?” I’m with you, sister. Well, I feel like, me, personally, I go through ups and downs, or cycles, when it comes to having energy. I’m not the best at balancing getting a good night’s rest, and making sure that I take really good care of myself, although those kind of things would help. I am committed, because my husband is so committed, to hiking, or walking a couple of miles every evening. And mostly, that’s all him. I mean, he’s very routine and habit-minded, thank goodness, because that keeps me on track, and that aspect of my life, being healthy. So to answer your question, I also struggle with levels of energy. And I know that when you scroll through Instagram, and you see other people’s feed, it just looks like, “Oh, my gosh. They’re getting so much accomplished. They’re doing so much.” But what you don’t know is that nearly every Saturday, I spend the entire day in my pajamas. Like, there is a good chance that I am not going to answer the door if you knock, because there’s no way you’re going to see me in my PJs. But I do make sure to squeeze in a hike or a walk in my neighborhood nearly every evening. And that certainly has helped with my energy levels. But I think that it’s important not to get upset with yourself, because I feel like when you feel tired, or you feel like, “I just don’t have the energy,” you should listen to that. It’s your body’s way of saying, “You know what? Your batteries are low. You need to recharge.” And if recharging means that you sit on the couch, and you watch hours of Parks and Rec, and you eat nothing but Smartfood’s Spicy Jalapeno Popcorn, not that I’m speaking from experience, that it’s okay. So go easy on yourself. I think the worst thing that we can do is beat ourselves up, or even worse, compare ourselves to what other teachers are doing. Another question, “My reason for writing is to see if you can help me with something.” I doubt it, but I’ll try. “A little while back, I remember seeing something you posted about art lesson plans and what they should look like. I thought I saved it to look back on, but I’ve searched and searched, and I can’t find it anywhere. If you know what I’m talking about, can you please direct me to where I can find it?” You know what? I am not the best person to ask about lesson planning. I’m just going to lay it out there for you. I don’t sit down and physically write out, word-for-word, my lesson plan. I do it in a kind of a different way, where I usually create what I’m thinking that my students will make; not so much as it being a teacher example, but more like so I can wrap my head around what they’re going to be creating, and hands, I guess, what they’re going to be creating, what hiccups they might find. And I also have discovered that when I try creating some of the things that I’m excited to share with my students, I get more ideas, and more thoughts come to me. So that’s kind of how my lesson plans play out. And once I’ve got that kind of figured out, then I start thinking about ways to incorporate other things; history, different kinds of media, other kinds of artists, and then I jot down my notes. But as far as a lesson plan goes, I don’t necessarily have like a really strict and structured template. 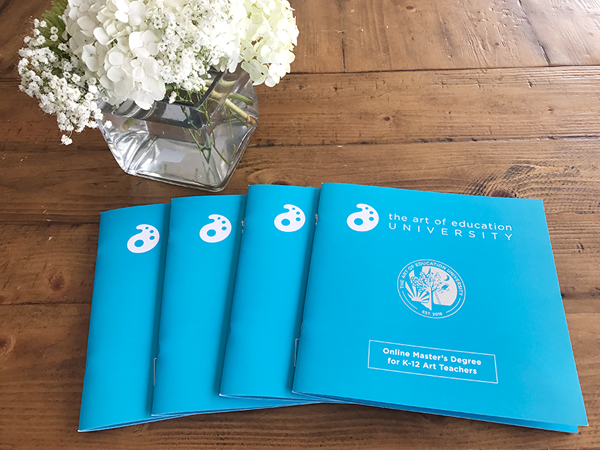 Pretty sure The Art of Education has something right up your alley. But just like you said, you were wondering if I could help you with something, it sounds like I’m not going to be able to be of much service. And for that, I apologize. Well, I just got shingles listening to, or reading this message, and my hands are sweating for you, because that is a lot. You’re teaching K through four, art and music. The first thing I would do is, I would keep it simple. And to do that, I would start by teaching the same lessons to some of the same grades. Perhaps kindergarten and first can be doing the same project, making it more advanced for first. Second and third, or maybe third and fourth can be doing the same project; again, advancing it a little bit more for fourth. You might want to consider, this is what I like to do when I’m feeling overwhelmed, using the same media with your students. For example, at the beginning of the year, all of my students were making those “getting to know you” paper sculptures, which means all I had to have prepped was a ton of paper strips and my glue cups. Now, my students have moved onto painting. So nearly all of my students, except for my third and fourth graders, all of my students are painting. So paint, and water trays, and paintbrushes, and paper, or whatever surface they’re painting on, is prepped and ready to go. So I’m not scrambling around, switching watercolor paint for, well, I was about to say weaving supplies, but yes, I am doing that, because I’m a crazy person. But keeping things more simplified, I have noticed, makes it so that I am not running and rushing around. I’m more calm. 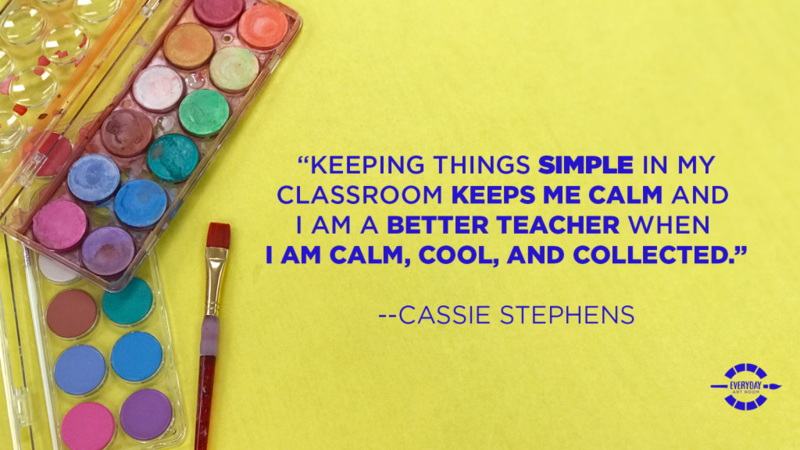 And when I’m more calm and relaxed, I do a far better job teaching than when I’m feeling flustered or frantic about getting everything ready. You might feel as though, “Oh, but I’m not doing the best job I can for the kids, because I need to have them all doing something different.” No. 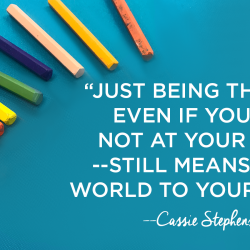 You are doing your best job for the kids when you are calm, cool, and collected, and not running around like a crazy person. Basically, you want to do the opposite of what I do, which is run around like a crazy person. So if I were going to be … If I were to find myself in your shoes, I would definitely stick with using the same media with my students; a clay week, a painting week, a drawing week. That way, the supplies are out and ready to go. I would definitely consider a common theme. Perhaps all of your students are learning about one movement in art history. Everybody’s learning about impressionism, and we’re all painting various types of impressionist landscapes while listening to music from that time period. Or maybe we’re all learning about one specific artist, James Rizzi, for example, and we’re all drawing Rizzi cities of varying degrees of difficulty. And then, maybe we’re listening to music, he actually was really influenced by music in New York, listening to the music that inspired him. So try, I feel like when you’re coming up with lessons, trying to have everything tie together is really, super helpful. And then when you are setting up your room and laying out your displays, everything is streamlined. Everything is one artist, all of his work, as opposed to a hodgepodge of Van Gogh here, James Rizzi there, impressionists over there, which is already making my eye twitch. I hope that helps, because I think that the key is to keep it simple. You’ll be happier for it. All right, moving on. “Hi, Cassie. Thanks for all you share and teach. I would love to hear you talk, and hear others, especially high school art teachers, discuss how they plan their lessons; specifically, paper lesson versus online.” Why am I reading these questions? So, yeah, high school teachers, can you please help us out here, and possibly share in the comments, what kind of lesson planner you use? Do you find it easier to use a handwritten planner, or online? Me, personally, I’m all about the handwritten. I love writing on a to-do list. I love sketching out ideas. And I even love drawing out display ideas, just so I can have a visual of what that will look like. And it definitely motivates and inspires me. So if I were to write out my lesson plans, I’d definitely be a person who writes it out, versus online. Okay, another question. “I know you have gotten this question before, but I heard you mention recently that you have an art playlist. I’m curious what you play for your students.” Well, I started creating an art room, “art class rocks” playlist last year. And I’m so sick of all of the songs, you guys don’t even know. I believe you can find the complete list on my blog. You could just search “art class playlist.” And I have everything from, a lot of songs from The Blues Brothers soundtrack, because I loved that growing up, to songs from like The Big Chill, which is also another great soundtrack; mostly, a lot of oldies, and things that make me happy, and songs that kind of speak to joy and kindness; REM’s, “Shiny Happy People,” Deee-Lite’s, “Groove Is in the Heart,” I mean, you know, just silly kind of things that make me happy. My music that I play is kind of like dance music and party music, which is great if you want to have a dance party. But a lot of times, I’m trying to inspire my students, especially my friends who have a hard time calming themselves down. I’m looking to add more calming music to my selection, so I will definitely keep you posted on that. But I would love to know what kind of songs you all play in your room. One thing I do really enjoy are books on, I guess you’d call it tape, but just books that the kids can listen to as they work. I’m really considering hopping on the Audible train and getting a subscription to that, so I can find some children’s books that way, because I feel like, I love reading to my students, but it’s difficult when I’m trying to teach them at the same time. So these questions have been so much fun to answer, guys. So let me see if I can dig through the mailbag and find us a couple more. Tim Bogatz: Hello. This is Tim Bogatz from Art Ed Radio. Just a quick reminder that you can find all things related to Everyday Art Room on the Art of Ed website, under the podcasts tab. 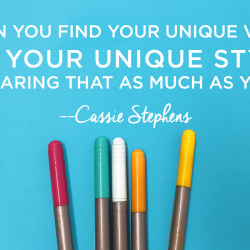 You’ll find the full transcript of every show, links to Cassie’s blog, AOE articles, and other resources that can help your teaching. It’s all at the TheArtOfEd.com, under the podcast tab. You can also sign up to receive weekly emails whenever a new episode is released. Now, let’s get you back to Cassie as she opens up the mailbag. Cassie: So if you follow my Instagram, I haven’t shared this yet on my blog, my students, my kindergarten and first-grade students are currently, still, working on their reversible Dot Day paintings. And they are painting on cardboard pizza rounds. My kindergartners are painting on 10-inch diameter circles, and my first graders are painting on 14-inch circles. And I have gotten a lot of questions, asking where did I get those cardboard rounds. And I have found them on Amazon before. They usually sell them in a box of about 100. And they usually have a bunch of different sizes. If you just search “cardboard pizza rounds,” then they will pop up. Me, personally, I found that there’s a place called Gordon Food Service that’s right around the corner from my house. And they sold those, as well as all those little condiment cups, and a bunch of other amazing things, that I just didn’t know my life wasn’t complete until I bought them. So if you’re wondering where I purchase those cardboard pizza rounds, that’s the place. I recently also shared on my Instagram about an art show, and I got a lot of questions about that. It says, one of the questions is, “What is this art show you’re talking about? I’ve heard of it and would love to look into it.” It is called Artome, A-R-T-O-M-E. And what Artome is, is that they send you the paper to create the artwork on, or you can attach the artwork to this paper. Basically, the paper is just regular paper, but it’s big enough that it has a little section for you to fill out information about your students on it; their name, their teacher’s name, their grade, the title of their artwork. And you, as the students finish up their artwork, you box it up. You ship it off to Artome, free of charge. Then, they come and set up an art show display for you. They double-mat the artwork. It’s framed. They set up all of the artwork on these little wire racks. You literally do nothing. And then you sell the artwork for one night, only. And then they charge, I believe, $19. You can upcharge it however much you like to get a profit for your school. So it’s a fundraiser, but it’s also just a great way to do a very low-stress art show. And I love it. And it always looks amazing. “How do you get your frames to stick to your wall in your classroom?” So I have a lot of stuff on the walls of my classroom, and my art room is filled with cinder blocks, walls, and wooden doors. And absolutely nothing sticks to those cinder blocks, especially in the summertime in Tennessee, when the humidity is on the rise. And, yeah, don’t even get me started. Nothing sticks. So one thing that I have found sticks 99% of the time are those 3M Velcro strips. So I purchase those so that they will hold up to 12 pounds, even though what I’m attaching doesn’t weigh that much. I have found that those work the best. And it’s just a little strip of Velcro with a sticky on the back that you can attach to any … I don’t use it on posters. I use it on something a little bit more heavy, like a picture that’s in a frame. And that’s what I use to hang most of the things in my room. Like those giant, wooden paintbrush paddle oars, those were hung with the Velcro, and they’ve yet to fall. I should probably knock on wood, because when I get to school tomorrow, there’s probably going to be one on the ground, saying, “Aha, fooled you.” So anyway, that’s what I use. Wow. Did I tell you that I love answering questions? Even though you probably don’t love always hearing my answers, especially when it comes to lesson plans. Aye, aye, aye. You guys are the best. And if you have a question for me, you should definitely send it my way. There’s a good chance I won’t respond, because I am, say it with me, the worst. But I just might share it here. Thank you guys so much for joining me on today’s podcast. Have a super week.